Oh my word, you guys. This could be – has been – is currently – a game changer in our collective coffee lives. It fits anywhere and everywhere into your life because when something is so luxuriously creamy, nutty, and sweet with a bite of salt, how can it not be? For example. It’s 6am and you’re getting up for an early work meeting, and you’d like to not hate the next two hours of your life. CASHEW COFFEE. It’s 10am and you work from home and it’s kind of rainy, so naturally a cozy pre-lunch pick-me-up becomes necessary. CASHEW COFFEE. It’s 2pm and you’re a stay-at-home mom and the kids are finally napping (I used to be a full-time nanny and I semi-know this feeling), and you want to give yourself a hug in celebration of fifteen minutes to yourself. CASHEW COFFEE. Holy creamy goodness. This is heaven-sent. About a year and a half ago, I made an important discovery with a tiny bit of help from my friend aka counselor: maybe it’s for the best if I don’t drink coffee. It’s one of those things you always think about, right? You always say that you should probably start cutting back on coffee, pop, caffeine, whatever… but for some people it’s not so much a thing-would-be-nice-to-do thing and more of a this-is-really-important-for-my-overall-well-being kind of thing. I found out last year that I am that person. Hi. Nice to meet you. I have some perfectionist, anxious, zero chill tendencies (gasp) and caffeine makes my brain WORSE, not better. If I am already a high-strung person, caffeine just takes the high-strung-ness to new heights that should not be humanly experienced. 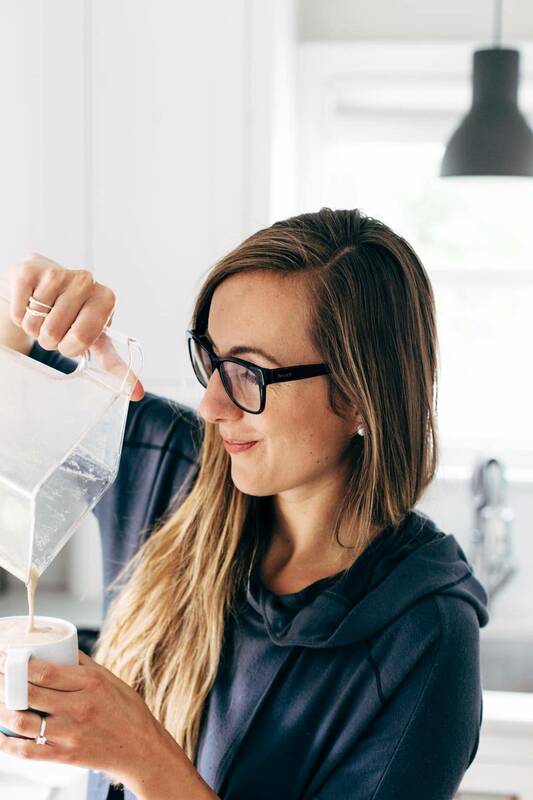 When I stopped drinking coffee, or more accurately, swapped my default morning coffee for the occasional decaf latte or Americano or – get this – MORE WATER, I found that my overall well-being dramatically leveled out. For those not familiar with being constantly in overdrive, leveling out is a good thing. It means calm. Normal. Eyes not bulging out of head, hair not standing on end, life not spinning wildly out of control. So I do love good coffee. Big fan over here. I still try to stay away from regular coffee for big-picture wellness reasons, but I love a deep, dark, mildly creamy cup of decaf in the morning. My two rules are that it has to be good coffee, and it has to be decaf. This is where my beloved (decaf) coffee journey will now merge with an old, trusted friend: wrinkly, buttery, roasted cashews. You can, in fact, BLEND CASHEWS INTO YOUR COFFEE and it will give you the best latte-like beverage of your life. What have I even been doing! This is hands-down the best latte – er, coffee? – I’ve ever had. I love the cashews both in theory (dairy free, healthy fats, etc.) and in taste (lightly sweet, nutty, and so super creamy). And when you add a spoonful of honey and a pinch of sea salt? Game over. Cashew coffee is going exactly nowhere. This is a new level of coffee enlightenment. Hey Mom, look at me! CREAMY FOAM ON MY COFFEE. Made it at home. By myself. NBD. Did I mention that there is no draining or straining or nut milk bags or any such fussing with this? No thank you, ma’am. For those who are concerned with this development and are having visions of cashew pieces floating in their coffee: I see you. I hear you. Let me calm your anxious hearts. 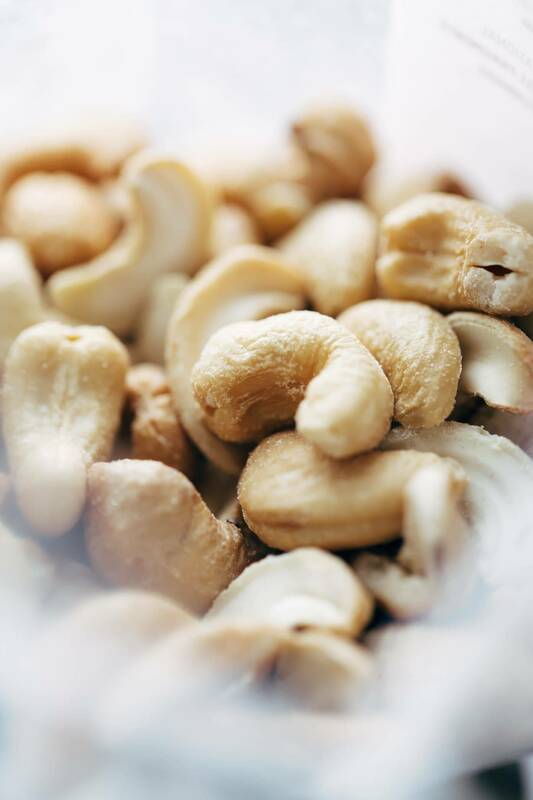 If using a high powered blender (preferably Vitamix, Blendtec, or equivalent), you should not have any trouble with cashew chunks. I used both types of blender and, with enough blend-time, I never had any issues with flecks that bothered me. You can see a few tiiiiny tiny flecks of cashew on the side of the blender in a few of these pictures, but it should be virtually imperceptible when you drink it. Just silky-smooth, luxe cashew latte texture. I don’t even know how it happens, but thankfully my job isn’t to know. My job is just to tell you about it. Okay, friends. This could be a game changer. TBH, I am so curious to see if you like it as much as I do. Bjork doesn’t love it – it tastes too cashewy for him, but I am ALL OVER IT. It is my new morning or afternoon “treat” coffee. If you try it and like it – either leave a comment and a rating, OR snap a picture and tag me on Instagram so I can see what you think. And PS. if you’re high strung like me? A) We’re awesome, and B) decaf all the way. Blend all ingredients for about 45 seconds in a high-powered blender. Start on a lower speed and gradually work your way up, ending with about 15 seconds on a very high speed to ensure smooth and creamy texture. Pour into a mug and enjoy, or chill for later (see notes)! I may not know you, but you sure can make me smile. This has to be the most wonderful hidden gem I’ve read about all week. Cashew coffee? Yes, please! Lindsay, I love the use of images and how you brought everything together perfectly. Thank you for the recipe, I will be sure to give it a try! Oh my goodness! This is amazing and, after being brave enough to try it, now have it once or twice a day. As an IC sufferer, I cold brew my coffee then heat it, the cashews, salt and honey in a pan before whipping it into a batch of frothy goodness. I cannot tell you how good, it feels to enjoy coffee — and GOOD coffee — once more. Thank you for sharing this recipe. So glad to hear that, Robin! Oh my goodness, I tried this with a little vanilla, & coconut sugar . I used salted roasted cashews (all I had on hand 🙂 ). I might as well throw out the coffee creamer, this is beyond GOOD!!!! Thank you!! Do you think it would work if instead of who,e cashews you used cashew butter? We’ve never tried that, so can’t say. Definitely worth a try though! I don’t know why it took me so long to make this. Just made it this morning and had to immediately comment on how great it is! Delicious! What a clever recipe, Lindsay! This sounds amazing! What brand of decaf do you use? I’ve heard certain kinds can have weird chemicals in them because of how it’s processed. What is the result please with instant coffee?I am going to take the plunge anyway and try it tomorrow afternoon! I love this recipe. I don’t have a high powered blender at home, so I’ve substituted with cashew butter (made from unsalted cashews). I wonder if the calorie count is a bit high. Black coffee = 2 cal, 1/4 cup cashews = 160 cal, 1 tbsp honey = 60 cal, should be around 222 cal no? Or am I missing something? I have loved all of your recipes that I have tried so far!! I soaked the cashews first (mainly because they were salted and I didn’t want my coffee THAT salty). So creamy and delicious! Just made! So good! Stole cashews already soaking for milk. Freshly ground the beans, brewed using pour-over method, Vitamix. Absolutely perfect results. This will be on permanent rotation as special treat in my house. Yum. Glad to hear it, Penny! Love this coffee. Thank you so much for the recipe! I add one medjool date instead of the honey and it gives a nice thickness. And no cashew taste. Lindsay, I can’t eat whole nuts or even small pieces, but do these cashews grind up really good, like almost to a paste? Yep! If you have a high powered blender, it will get really smooth. Amazing! I just made it but I used a dark coffee in my keurig and brewed it on the 6oz setting. I did two brews so 12oz, 1/4 cup of cashews, went with erythritol as a sweetener and salt free and it takes identical to Starbucks.